Wash and soak black gram dAl in water for ½ an hour and grind it coarsely like for VaDai, with green chillies, asafoetida and salt. Heat oil and add the curry leaves with mustard seeds. Then add the above paste and sauté it. Add coconut and fry for 2 minutes and remove from fire. The paste will break loose. Add 2 cups of water and a spoon of oil to rice flour and heat it in a low fire. Keep stirring often and make the dough thick and colourless. Divide the dough into small balls. Convert the balls to an elongated bowl shape with the help of oil and your fingers. Fill each bowl with the above filling paste. Close it with a little water. Steam it in pressure cooker for 7 minutes without weight. For iDli refer to my previous posting. By mixing both the names, some people call this as AmmaNi PAppA or AmmaNi kozhukkaTTai. 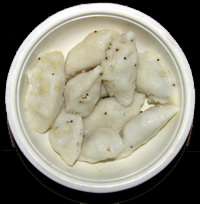 Thius is made from the rice dough after making kozhukkaTTai or dough is again prepared as for kozhukkaTTai. Normally this is made in the evening and is not a nivEdana item. Wash and soak the dAs for about an hour. Boil 1½ cup of water in a heavy bottomed vessel with ½ tsp salt and 1 tea spoon oil. When it boils add rice flour. Stir to mix evenly to avoid lumps. Remove from the heat / fire and set aside to cool down for a while. Knead into soft dough to remove lumps, if any. Then, form small marble sized balls of the mixture after smearing the fingers with oil from time to time. 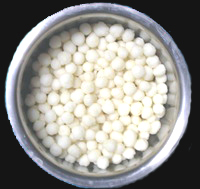 Steam the balls over idli plates or a big plate with small holes after placing a white cloth or plantain leaf over it in pressure cooker without putting the weight as done for iDli. After the steam comes out, wait for 2 to 3 minutes and check if the balls are well cooked. If not, keep for another 2 to 3 minutes. Then remove the balls. Drain the water out of the soaked dAls, add chillies, 1 tsp salt and asafoetida. Grind them without adding much water into a coarse paste as done for VaDai. Remove this and place over a plate smeared with a little oil. Then steam it in a cooker for 7 minutes without placing the weight. Remove, cool and disintegrate it by just running it in the mixie for a second under the lowest speed. Then take a kaDAi. Add 2 tbs oil and then mustard. When it splutters add the curry leaves and the rice balls. Let the balls be sautéed for 5 minutes. Now add the dAl mixture, grated coconut and again sauté for 5 minutes. Serve hot. 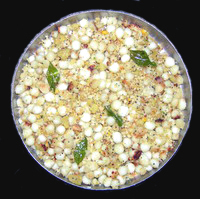 This entry was posted on August 3, 2011 at 7:52 pm and is filed under Thamizh Festivals with tags asafoetida, black gram dAl, cardamom, curry leaves, ellu, ellukkozukkattai, ginger, grated coconut, green chilly, gur, jaggery, kozukkattai, medu vadai, modakam, plain vadai, raw rice, refine oil, salt, Tamil festivals, tengai poornam, Thamizh, til, ulundu vadai, urad dal, vadai, Varalakshmi vratam, white sesame seeds. You can follow any responses to this entry through the RSS 2.0 feed. Both comments and pings are currently closed.